‘The best horn section in The World’ – Mark Ronson. The Haggis Horns are a 7 piece live funk extravaganza combining heavy breakbeat funk, soul,hip-hop & afrobeat with the virtuosity of trained jazz musicians. DJ Format’s 2003 debut ‘Music for the Mature B-Boy’ was one of the seminal UK hip hop / funk releases of the era, DJ Format is one of the few producers from these shores to successfully collaborate with US MCs, his tracks with Jurassic 5 are bonafide classics and his subsequent releases have cemented his position as a pioneer in the UK scene. First Word released his Simonsound project back in 2008 – a project put together with his long-time friend and cohort Simon James. With it’s mix of switched on covers of B-Boy classics and experimental synth oddities it won the duo fans including DJ Spinna, Kenny Dope and Gilles Peterson. As a DJ, Format is out on his own, with a collection of classic hip hop, funk, latin, psych and beyond that is unrivalled. Tonight he’ll be following the Haggis Horns set, digging deep into his funk and soul 45s with a fair few curveballs no doubt! 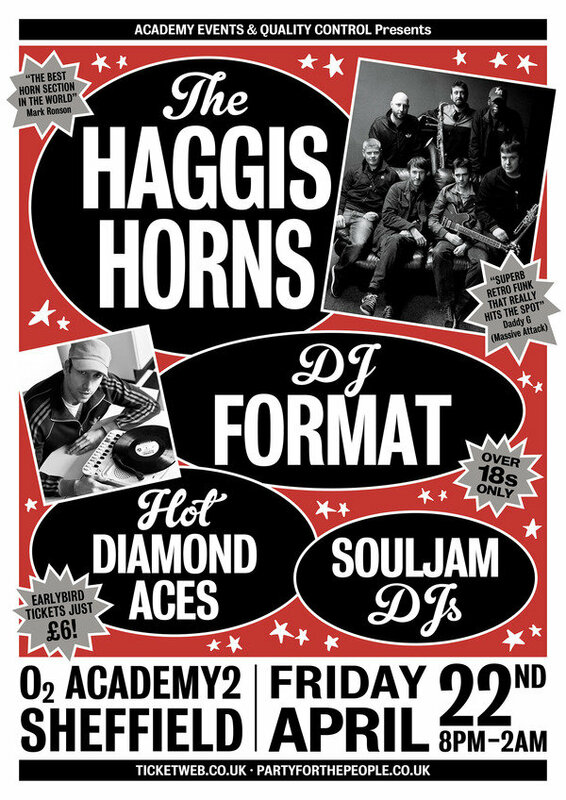 Support comes from the fantastic Hot Diamond Aces and purveyors of the finest funk & soul, Souljam DJs.